Microwaveable Oats with Freeze Dried Raspberries, Dried Apple & Acai with Added Vitamins C, B6, D & Zinc. † Oat beta-glucan has been shown to lower blood cholesterol. High blood cholesterol is a risk factor in the development of coronary heart disease. For over 140 years, the humble oat has inspired Quaker to make delicious, nourishing food. 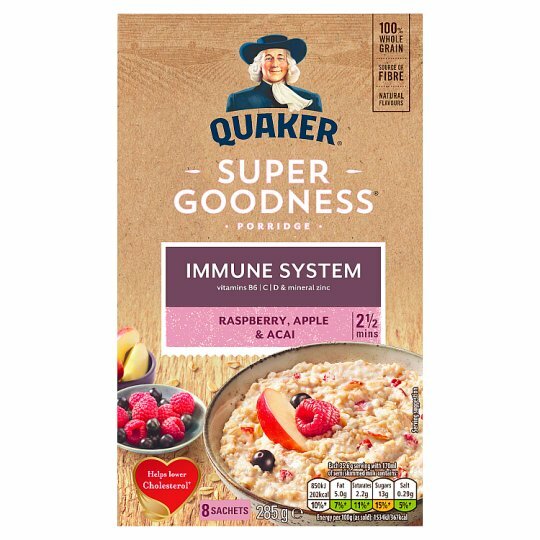 This super goodness porridge contains wholegrain oats and delicious real fruit pieces with added nutrients that help support your immune system to super start your morning. Oat beta-glucan 2.8g per 100g. Each serving (35.6g) contains 33% of the 3g of oat beta-glucan suggested per day. 1. Tear open the sachet along the tear line. 2. Pour the oats out into a microwaveable bowl. 3. Use the sachet to measure the milk - Fill to the milk line (170ml). 4. Pour the sachet of milk into the bowl & mix. 5. Place the bowl in the microwave for 2 1/2 mins on full power (Cat E min 800w). 6. Ping! Stir & Enjoy.